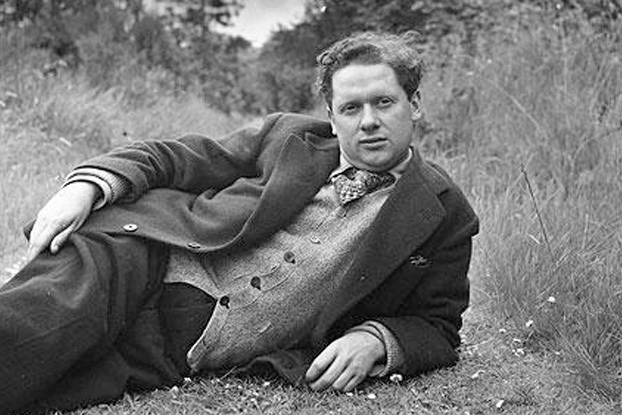 The legend of Dylan Thomas remains strong almost 60 years after his death, remembered as much for his stirringly lyrical poetry, created in a sea of modernism, as for his passion for drinking. He was born in 1914 in Swansea to a schoolteacher father and a seamstress mother, a brother to their eight-year-old daughter Nancy. Their parents were fluent in Welsh and passionate about their culture, yet Thomas and his sister were both raised as solely English speakers. Thomas failed to show interest in all aspects of his schooling, other than English classes and the school paper, to which he contributed poems. He left his grammar school at the age of 17 to become a newspaper journalist for the South Wales Daily Post. He only lasted in the job for 18 months before moving into freelance journalism, which gave him just enough money to support his poetry writing and his growing interest in drinking. He socialised with artists, musicians and poets in the Kardomah Café in central Swansea, a popular drinking hole that was destroyed during the bombing of the city in 1941. However, by the time the café was bombed, Thomas' life had changed dramatically. Following his foray into journalism, Thomas committed to life as a poet. His work was frequently published and garnered the attention of more established poets, but he was paid little or nothing for them, and relied on small fees, loans from friends and handouts from wealthy patrons to make ends meet. In 1936 in a London pub he met Caitlin Macnamara, a 23-year-old Irish dancer who enjoyed a bohemian lifestyle that included taking numerous lovers, most notably the artist Augustus John, who was 35 years her senior and responsible for introducing her to her future husband. Thomas and Macnamara clicked immediately and soon began a relationship marked by frequent stretches of time apart. They each moved between London, Wales and Ireland, staying with family and friends, trying to make ends meet, and spending time together when possible. They married in Cornwall in 1937 and continued to live a peripatetic life together, eventually settling in Laugharne, Wales, in the Boat House, a primitive property purchased for 3000 pounds by one of Thomas' patrons. Together they produced three children: son Llewelyn, born in 1939; daughter Aeronwy, born in 1943; and son Colm born in 1949; yet their marriage was marked by ongoing infidelities on both sides. Deemed physically unfit for the frontline, Thomas worked a desk job during World War II, writing film scripts for the Ministry of Information, while still writing poetry and drinking on the side. Money was increasingly a problem as his and Caitlin's family grew, with small loans and poetry sales insufficient to meet their needs. Thomas accepted an invitation from John Malcolm Brinnin (Director of the Poetry Center in New York) to visit the US on a reading tour in 1950. He spent three months travelling the country, performing his poems and being widely praised for his mellifluous way of speaking. While he was paid well for his efforts, he had little to show for it when he returned home, and what was left went towards paying debts. Caitlin, unhappy at being left behind to perform domestic duties, insisted on accompanying Thomas on his next trip, in 1952. He travelled back to the US alone early in 1953 and it was during this visit that his new work Under Milk Woodwas performed on stage for the first time at The Poetry Center, with Thomas playing First Voice and Reverend Eli Jenkins. This trip to the US was only six weeks long, but his relationship with his wife had deteriorated to such a degree that he made plans for another visit as soon as he returned home. Thomas made his final trip to New York in October, 1953, for a series of performances of Under Milk Wood. In the company of Liz Reitell, an assistant working for Brinnin who had become Thomas' mistress on his previous trip to New York, he drank heavily on this visit. After questionable medical care and continued drinking, Thomas fell into a coma and was taken to hospital by Reitell. His wife was called and she immediately flew to see him, and she was by his side when he died two days later, on the 9 November at the age of 39. It is often said that Thomas died of alcohol-related illness, yet his official cause of death was identified as pneumonia, and doctors found little evidence of cirrhosis of his liver in the post mortem.